Mickey Prohaska, the smooth-talking, ethically challenged insurance salesman played by Greg Kinnear in Thin Ice, could well have wandered through the hotel hallways at the annual convention that figured pivotally in last year's Cedar Rapids. Mickey would have been one of the guys in the lounge, trying to nab new clients with a huckster's gusto. And he would have been one of the guys who brings a drunkenly obliging woman back to his room, never mind the marriage back home in Wisconsin. But if Mickey wasn't in the Ed Helms/John C. Reilly comedy, he is in Thin Ice. It's a darkly comic morality tale in which - if you ignore the upbeat, voice-overed prologue and epilogue - our hero finds himself trapped in a nightmarish scenario of larceny and murder. A nightmarish scenario of his own making. Crisply directed by Jill Sprecher (Clockwatchers) with an effectively creepy (but funny) turn from Billy Crudup and a doddering (but funny) one from Alan Arkin, Thin Ice finds Mickey, desperate for cash, trying to scam Gorvy, an absentminded old farmer (Arkin), out of his prized violin. Gorvy has only recently discovered its worth - it's been a toy he lets his pet dog, Petey, play with. But an instrument appraiser tells him it's an 18th-century Viennese gem, valued in the five figures, at least. And Mickey needs those five figures to get the debt and despair out of his life. 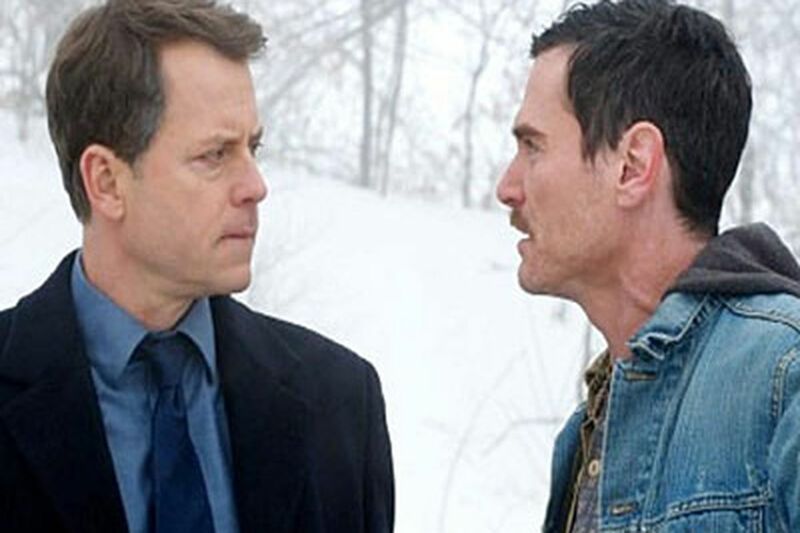 With a bit of the David Mamet-ian con about it, Thin Ice follows Mickey as he ingratiates himself with Gorvy, and then, through a series of ill-timed coincidences and encounters, finds himself caught up in a bigger and bigger mess: identity theft, a body dragged across an icy lake, cops sniffing around, and a jumpy ex-con (Crudup) threatening extortion, and, if that doesn't work, extinction. Kinnear puts his affable everyman persona to work, insuring (so to speak) that his sleazeball insurance agent somehow wins our sympathy, although everything Mickey does - to his wife (Lea Thompson), to his secretary (Michelle Arthur), to his new salesman hire (David Harbour) - is contemptible, and even criminal. Contact movie critic Steven Rea at 215-854-5629 or srea@phillynews.com. Read his blog, "On Movies Online," at www.philly.com/onmovies.